THE BEGINNERS GUIDE TO MAKING YOUR OWN MILK — Local Goods Company - Connecting you to the best in the Sea to Sky! No nasty preservatives and ingredients that are currently in the store bought kinds. Freshness. Why drink something that was made weeks ago when you can drink something made now. No packaging being sent to landfill. No resources & energy used to make the packaging. Taste. Once you've made your own, the store bought kind will taste artificial and stale in comparison. 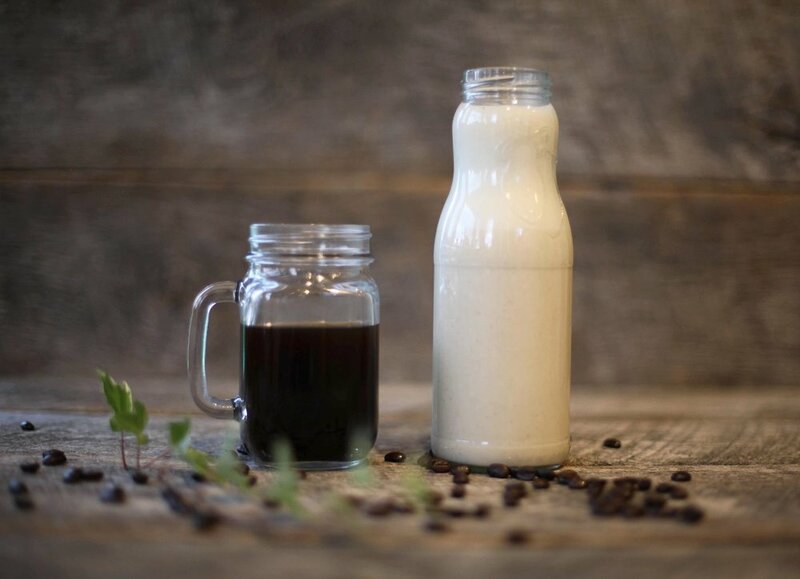 Homemade milks can be used in coffee, cereal, oatmeal and best of all, smoothies. Want to eat kale but don't like the taste? No problem, add some homemade milk to a blender with a banana and you'll be doing it every day. So first thing you need to know about living a processed food free life, is that you have to get into the habit of sometimes letting ingredients soak. Before going to bed or first thing when you arrive home from work, are good times to put your nuts and legumes in water. If you want to make your milks sugar free, remove the dates, maple syrup and honey. Or you can simply use less if they turn out to be too sweet for you. We've also listed some optional ingredients that can be added to change up the flavors of your milks. Experimenting is a good idea and your personal preference might lead you to tweak the amounts we use in our recipes. Don't heat it up and if you do, it has to be done slowly if you don't want it forming a thick sludge. Throw away the water you use to soak your nuts and rice. You can mix the seeds, nuts or grains depending on your budget and what you like the taste of. You will need to shake the bottle your milk is in BEFORE each use. **Read more about why you should soak here. INSTRUCTIONS: Put all the ingredients in a blender and blend for 30 to 60 seconds. You can then strain the milk using a milk or mesh bag. We only strain the milk we use for coffee and the pulp can be added to smoothies or baking recipes. NUTRITIONAL INFORMATION: Almonds are filled with monounsaturated fatty acids, dietary fiber, antioxidants, riboflavin and magnesium. They are also high in iron, protein and promote healthy hair and skin. Dates are a good source of iron. **We sometimes substitute the almonds for high grade almond flour. For those who can't be bothered to strain, it's a simpler alternative. INSTRUCTIONS: Put all the ingredients in a blender and blend for 30 to 60 seconds. This milk doesn't need to be strained. NUTRITIONAL INFORMATION: Cashews contain copper, zinc, magnesium and phosphorus. They contain a good amount of protein and have a healthy fat content. Dates are a good source of iron. INSTRUCTIONS: Put all the ingredients in a blender and blend for 30 to 60 seconds. You can then strain the milk using a milk or mesh bag. We only strain the milk we use for coffee and the pulp can be added to smoothies or baking recipes. Add more water to your mix if you don't want to strain and blend for an extra 30 seconds. NUTRITIONAL INFORMATION: Coconut is a great source of minerals such as copper, calcium, iron, manganese, magnesium and zinc. Dates are a good source of iron. NUTRITIONAL INFORMATION: Hazelnuts are high in healthy fats and are packed with flavonoids which support brain health and improve circulation. They also contain high amounts of vitamin B & E. Dates are a good source of iron. INSTRUCTIONS: Put all the ingredients in a blender and blend for 30 to 60 seconds. This milk doesn't need to be strained. Some people feel this milk is slightly bitter so mix with another seed or nut if this is the case. NUTRITIONAL INFORMATION: High in protein, essential fatty acids and amino acids, hemp seeds are not only very nutritious but also have a great nutty flavor. Dates are a good source of iron. INSTRUCTIONS: Soaking in boiling water for an hour will give the milk a smoother consistency. Put all the ingredients in a blender and blend for 30 to 60 seconds. You can then strain the milk using a milk or mesh bag. We only strain the milk we use for coffee and the pulp can be added to smoothies or baking recipes. NUTRITIONAL INFORMATION: Rolled oats are a good source of iron and dietary fiber and contain 7% DV of thiamine, which is a critical nutrient to energy metabolism. Interestingly, the soluble fiber in oats attaches to cholesterol molecules and transports them out of the body rather than being absorbed into the bloodstream, which can help lower cholesterol and reduce the risk of heart disease. Dates are a good source of iron. NUTRITIONAL INFORMATION: Pumpkin seeds are high in protein, fiber, vitamin A & C and calcium. They also have anti-inflammatory properties and are a great replacement for nutrients found in nuts for those with allergies. Dates are a good source of iron. INSTRUCTIONS: Pour 2 cups of hot water over your rice or cook for 20 minutes. If soaking, wait until the water cools and then put the rice in the fridge over night or leave out covered depending on the time you are starting your soaking. Drain the rice (do not use the water you soaked your rice in) and put all the ingredients in a blender and blend for 30 to 60 seconds. You can then strain the milk using a milk or mesh bag. We only strain the milk we use for coffee and the pulp can be added to smoothies or baking recipes. NUTRITIONAL INFORMATION: Rice is low in fat and high in carbohydrates. Dates are a good source of iron. NUTRITIONAL INFORMATION: Sesame seeds are filled with protein, reduce cholesterol and reduce high blood pressure. Its high content of zinc promotes healthy skin. Dates are a good source of iron. INSTRUCTIONS: Put all the ingredients in a blender and blend for 30 to 60 seconds. This milk doesn't need to be strained and it tastes really great with coffee. NUTRITIONAL INFORMATION: Sunflower seeds are a high source of Vitamin E and boost cardio-vascular health. They also promote hormonal balance and are very affordable. Dates are a good source of iron.